For other uses, see Hero (disambiguation) § Film. 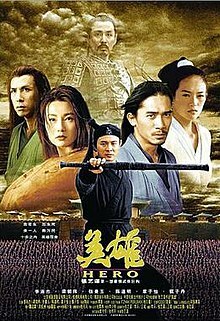 Hero is a 2002 Chinese wuxia film directed by Zhang Yimou. Starring Jet Li as the nameless protagonist, the film is based on the story of Jing Ke's assassination attempt on the King of Qin in 227 BC. Hero was first released in China on 24 October 2002. At that time, it was the most expensive project and one of highest-grossing motion pictures in China. Miramax Films bought the American market distribution rights, but delayed the release of the film for nearly two years. Quentin Tarantino eventually convinced Miramax to open the film in American theaters on 27 August 2004. The film became the first Chinese-language movie to place No. 1 at the American box office (where it stayed for two consecutive weeks) and went on to earn $53.6 million. In ancient China during the Warring States period, Nameless, a Qin prefect, arrives at the Qin capital city to meet the king of Qin, who had survived an attempt on his life by the assassins Sky, Flying Snow, and Broken Sword. As a result, the king has implemented extreme security measures: no visitors allowed to approach the king within 100 paces. Nameless claims that he has slain the three assassins and he displays their weapons before the king, who allows the former to approach within ten paces and tell him his story. Nameless recounts first killing Long Sky, before traveling to meet Flying Snow and Broken Sword, who had taken refuge at a calligraphy school in the Zhao state. He tells Sword that he is there to commission a calligraphy scroll with the character for "Sword" (劍), secretly seeking to learn Sword's skill through his calligraphy. Nameless also learns that Snow and Sword, who are lovers, had gradually grown distant. Once the scroll is complete, Nameless reveals his identity and challenges Snow to a duel the next day, to avenge her secret lover Long Sky. Sword, in anger at Snow's betrayal to him, makes love to his pupil Moon, and is seen by Snow. In revenge, Snow kills Sword, followed by Moon when she attempted to seek revenge for her master. The next day, Nameless kills the emotionally unstable Snow before the Qin army, and claims her sword. As the tale concludes, the king expresses disbelief and accuses Nameless of staging the duels with the assassins, as in the previous assassination attempt he had perceived Sword as an honourable man who would not stoop so low as to cheat on Snow. The king then suggests that what really happened was that the assassins volunteered their lives so that Nameless could gain the king's trust, which would allow Nameless to get close enough to the king to kill him. He then narrates his guess at what really happened. In the king's hypothetical version of the story, Nameless had sought out Snow and Sword after staging the battle with Sky, telling them that he had acquired a special technique that would allow him to kill any target that is within ten paces. Nameless explains that he can use this technique to kill the king, but to get close enough he must present Snow's and Sword's weapons to the king. He further explains that he only needs to kill one of them in public to "prove" that he has killed both of them. Snow and Sword argue over who should be the one to die, which results in a short fight in which Snow is quicker and manages to injure Sword. Snow then proceeds to meet Nameless before the Qin army while Sword, still recovering from his wound, watches helplessly as Snow is defeated. Moon then gives Nameless her master's sword, telling him that the swords of Snow and Sword should remain together in death as they had in life. Nameless admits that he does indeed possess the special technique the king alluded to. However, he states that the King had underestimated Sword, and tells the true story. Nameless says that the special technique, while deadly, can also be used to deal a seemingly-fatal blow that nonetheless misses all the victim's vital organs. He had used this technique on Sky, and now asked Snow and Sword to cooperate by faking a duel with him as well. He demonstrates the technique by showing that it is highly accurate as well as deadly. Snow agrees to the plan, but Sword refuses. Snow angrily accuses Sword of ruining the opportunity they had three years ago, when they had broken into the Qin palace yet Sword had refused to kill the king. She then attacks Sword, and manages to wound him with Nameless's help. The next day, Nameless "kills" Snow in front of the Qin army. Sword sends Nameless off to the Qin capital, writing the words Tianxia in the sand before leaving. Sword had not killed the king 3 years ago because he desired a unified, peaceful state, and only the king of Qin could achieve that vision. The king, touched by the tale and by Sword's understanding of his dream to unify China, ceases to fear Nameless. He tosses his sword to Nameless and examines the scroll drawn by Sword. The king understands that it describes the ideal warrior, who, paradoxically, should have no desire to kill. When Nameless realizes the wisdom of these words, he abandons his mission and spares the king. When Snow learns that Sword had convinced Nameless to forgo the assassination, she furiously attacks Sword and unintentionally kills him when he chooses not to defend himself so that she would understand his feelings for her. Overwhelmed with sorrow, Snow commits suicide. Urged by his court, the king reluctantly orders Nameless to be executed at the Qin palace for his assassination attempt. He understands that in order to unify the nation, he must enforce the law and use Nameless as an example. As the film ends, Nameless receives a hero's funeral and a closing text identifies the king as Qin Shi Huang, the first Emperor of China. An unknown prefect of a small province, orphaned at an early age. Forged into a master swordsman over years of training, Nameless possesses the singular technique "Death at Ten Paces" allowing him to strike precisely within that distance. He is the primary conspirator to assassinate the king, but ultimately decides that China's unification and peace are more important than vengeance. Hero also saw Jet Li's first appearance in a film produced by mainland China, after his debut in Shaolin Temple. Broken Sword and Flying Snow are the only assassins to ever infiltrate the king's palace, killing hundreds of his personal guard and very nearly the king himself before halting at the last moment. Of all the assassins, Broken Sword is the only one whom Nameless considers his equal in swordsmanship. A skilled assassin, Flying Snow is Broken Sword's lover and his equal as a swordsman. She has vowed revenge upon the King for killing her father in battle. When Broken Sword convinces Nameless to abandon the assassination attempt on the king, Flying Snow kills him and later herself. An ambitious leader who desires to become the first Emperor of China. Following an assassination attempt, he withdraws into his palace, which he empties of all but his most trusted advisors, and always wears his battle armor. An accomplished spearman, Sky is the first to be "defeated" by Nameless, who takes Sky's broken spear as proof of his defeat to the king. He is the least-seen assassin in the film. Broken Sword's loyal apprentice, skilled in using twin swords. When Hero opened in Hong Kong in December 2002, it grossed a massive HK$15,471,348 in its first week. Its final gross of HK$26,648,345 made it one of the top films in Hong Kong that year. On 27 August 2004, after a long delay, Hero opened in 2,031 North American screens uncut and subtitled. It debuted at #1, grossing US$18,004,319 ($8,864 per screen) in its opening weekend. The total was the second highest opening weekend ever for a foreign language film; only The Passion of the Christ has opened better. Its US$53,710,019 North American box office gross makes it among the highest-grossing foreign language films and martial arts films in North American box office history. The total worldwide box office gross was US$177,394,432. The film received extremely favorable reviews, scoring 95% at Rotten Tomatoes and 85 at Metacritic, indicating "universal acclaim". Roger Ebert called it "beautiful and beguiling, a martial arts extravaganza defining the styles and lives of its fighters within Chinese tradition." Richard Corliss of Time described it as "the masterpiece", adding that "it employs unparalleled visual splendor to show why men must make war to secure the peace and how warriors may find their true destiny as lovers." Michael Wilmington of the Chicago Tribune called it "swooningly beautiful, furious and thrilling" and "an action movie for the ages." Charles Taylor of Salon.com took an especially positive stance, deeming it "one of the most ravishing spectacles the movies have given us". Nevertheless, there were several film critics[who?] who felt the film had advocated autocracy and reacted with discomfort. The Village Voice's reviewer deemed it to have a "cartoon ideology" and justification for ruthless leadership comparable to Triumph of the Will. In 2014, Time Out polled several film critics, directors, actors and stunt actors to list their top action films. Hero was listed at 77th place on this list. The film also has been interpreted as a nuanced investigation into the relationship between culture on one hand, and political or military power on the other. In this approach, the film comments not only on China and its position in the world, but also on the ongoing erasures of languages and cultures under globalization. There has been some criticism of the film for its American-release translation of one of the central ideas in the film: Tiānxià (天下) which literally means "Under heaven", and is a phrase to mean "the World". In fact, for its release in Belgium, some two years before the U.S. release, the subtitled translation was indeed "all under heaven". However, the version shown in American cinemas was localized as the two-word phrase "our land" instead, which seems to denote just the nation of China rather than the whole world. Whether Zhang Yimou intended the film to also have meaning with regard to the world and world unity was at that time difficult to say. Zhang Yimou was asked about the change at a screening in Massachusetts and said it was a problem of translation: "If you ask me if 'Our land' is a good translation, I can't tell you. All translations are handicapped. Every word has different meanings in different cultures." However, in Cause: The Birth of Hero – a documentary on the making of Hero – Zhang mentions that he hopes the film will have some contemporary relevance, and that, in the aftermath of the September 11 attacks (which took place just before the movie was filmed) the themes of universal brotherhood and "peace under heaven" may indeed be interpreted more globally, and taken to refer to peace in "the world." The phrase was later changed in television-release versions of the film. Miramax, the film studio, owned the American-market distribution rights, but delayed the release of the film, a total of six times. Import DVDs of the film were sold online and Miramax demanded that the sites cease selling the DVD. The movie was finally released in American theaters on 27 August 2004 after intervention by Disney executives, Government of China and Quentin Tarantino, who helped secure an English-subtitled release. Tarantino also offered to lend his name to promotional material for the film in order to attract box office attention to it; his name was attached to the credits as "Quentin Tarantino Presents". In addition, a sword held by Jet Li's character in the original promotional poster was replaced by weapon resembling a katana, a Japanese weapon, in the North American promotional poster, which was both anachronistic and culturally misplaced. The United States version of the DVD, with Mandarin, English, and French soundtracks, was released on 30 November 2004. The film was scored by Tan Dun, who also conducted the China Philharmonic Orchestra and Chorus for the recording. A majority of the tracks feature Japanese taiko drum ensemble Kodō. Itzhak Perlman performs most of the violin solos, with additional solos by Tan Dun himself. The theme song, Hero (英雄), composed by Zhang Yadong and Lin Xi, was sung by Faye Wong. It is unavailable in the American versions of the film DVD and soundtrack album. Wind & Sand (風沙) is a song inspired by the film and was sung by Tony Leung. The musical instrument seen and played during the fight in the weiqi courtyard scene is a guqin. The guqin music for that scene was performed by Liu Li. ^ a b "Hero at BoxOfficeMojo.com". ^ "Hero". Turner Classic Movies. United States: Turner Broadcasting System. Retrieved 26 May 2018. ^ a b Ebert, Roger. "Hero". Chicago Sun-Times. ^ Jones, Arthur (5 January 2003). ‘Hero’ kicks B.O. records." Variety.com. Retrieved 26 September 2018. ^ a b "Quentin Tarantino Holds Out for HERO" (15 March 2004). Fangoria. Retrieved/archived from Fangoria.com, 8 February 2006. ^ Johnson, G. Allen (3 February 2005). "Worldwide, Asian Films Are Grossing Millions. Here, They're Either Remade, Held Hostage or Released with Little Fanfare." San Francisco Chronicle. Retrieved/archived from SFGate.com, 1 September 2012. ^ "Foreign Language – Box Office History". Retrieved 2009-01-13. ^ "Action – Martial Arts". BoxOfficeMojo.com. Retrieved 2009-01-13. ^ "Hero at Rotten Tomatoes". ^ "Hero (2004) at Metacritic". ^ Corliss, Richard (15 August 2004). "Men, Women and Fighting". Time. Retrieved 4 May 2010. ^ Wilmington, Michael. "Hero". Chicago Tribune. Archived from the original on 26 November 2010. Retrieved 24 August 2010. ^ ""Hero" – Salon.com". Archived from the original on 23 December 2006. ^ J. Hoberman (17 August 2004). "Man With No Name Tells a Story of Heroics, Color Coordination". Village Voice. Retrieved 2016-11-27. ^ Larson, Wendy (2017). Zhang Yimou: Globalization and the Subject of Culture. Amherst, New York: Cambria Press. pp. 271–304. ISBN 9781604979756. ^ Anderson, Jason (2004-09-30). "Getting lost in translation". Eye Weekly. Archived from the original on 2006-05-21. Retrieved 2010-08-24. ^ ""Cause: The Birth Of Hero" Documentary". ^ "Slideshow: Studio Warns Kung Fu Site". Wired. 15 December 2003. ^ Holson, Laura M. (10 August 2004). "Disney in Talks On Independence For a Weinstein." The New York Times. Retrieved from NYTimes.com, 26 September 2018. ^ Smith, Jim (2005). Tarantino. London: Virgin Books. p. 202. ISBN 0-7535-1071-5. ^ "2003 Taurus World Stunt Awards: Nominees & Winners" (PDF). Taurus World Stunt Awards. Archived from the original (PDF) on 1 October 2011. ^ 第26届《大众电影》百花奖颁奖 [26th Hundred Flowers Awards ceremony] (in Chinese). xinhuanewsnet.com. 3 November 2003. ^ "Hero soundtrack CD track list at YesAsia.com".